No I don’t think you are cheap and you will never hear me say that, trust me. A friend of my wife who has a great job in a senior level position as does her husband feel that we are too cheap when it comes to decorating our house. I guess everyone has their own definition of cheap and frugal but for us it’s simply spending less when we can. We know loads of people who skim the online ads looking for a deal in their community. Newlyweds and those moving into their first place typically have what they acquired over the years living at home or while away at school. With more and more students exiting school with student loans that may take them years to pay off scouting for discounts on home décor is worth the effort, in my opinion. Everything in Cheryl’s house (changed her name) is pristine and has the price tag to prove it. When we were house sitting their cat on the weekend just going inside their house alerted us to the smell of a new home. She keeps it immaculate and she spares no money when it comes to decorating the house inside and out. Her theory is that since we have decent jobs that we shouldn’t need to buy anything but new because we earned it. 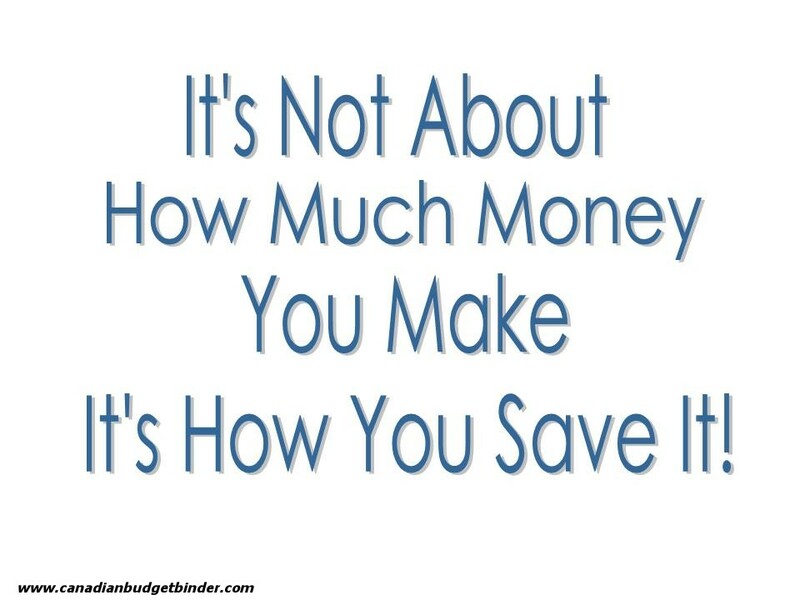 It’s not about how much money you make it’s how we save it. Sometime I have to keep reminding myself of that so it sinks in even when the pressures of our friends try to sneak in. I don’t worry about what they think, they are still our friends I just don’t need to follow through to be “spenders” like them. Even top designers flock to second-hand shops looking for furniture they can re-cover or re-use for an upcoming project for all types of clients. I just believe that many people associate a new home with new stuff and that’s not always the smartest way to think. We prefer ‘new to me’ stuff as well as shopping for new items at discount prices, which works equally as fine. Most people who come around think that our house is gorgeous inside. She also says we are very cheap by the way we live our life considering we don’t need to as we are debt-free, although that wasn’t always the case. I think now that we are practically mortgage-free we can splurge a bit more on what we want but we still can’t bring ourselves to spend like nobody is looking. It seems like it would be defeating the purpose, besides we have other goals we need to focus on as well. Just because you are debt free doesn’t mean you should go hog-wild with life. That’s how people get into trouble in the first place sometimes. Overall, no one bothers us when they think we are too frugal , it’s their opinion and if it makes us happy and it’s not crazy over the top “cheapskates” crazy then we’re happy with that. Whether you are moving into a new home or simply want to decorate rooms in your home or apartment the frugal way it doesn’t have to cost you an arm and a leg. One of the worst things about moving into a new home is the house interiors are empty meaning each room you walk in needs a vision to bring it to life. It may not be the worst thing in the world, heck for some people they love decorating and thrive on finding the right furniture, décor and accessories to make the space livable, stress free and easy on the eye. For others, well they could care less and any old furniture will do. Some vintage pieces really do make a room stand out. What to do when moving into a new home? Well, if you are moving into a new home from an apartment than you likely already have furniture you are brining with you so you should have a relatively good idea where you want to put things. If you are making a move into a new home after getting married and/or moving out of your parents you may not have to worry about hiring a rental truck to get you from point A to point B either. Most times you can stuff a vehicle full of belonging or toss a bed in a friends truck just to save some cash, rather than renting a truck. Sometimes it’s nice to move in to a new place without having too much stuff so you can take your time decorating rooms throughout the house the way you want without having too much clutter. Keeping organized is so important otherwise you simply end up with a mish mash of items you don’t need. A friend of ours made her own roller blinds instead of going to an expensive big box store or even costlier having them custom-made. She used her sewing skills and made her own which is great if you want to add your own personal touch. If you are handy there are many DIY ways to decorate your room starting with a simple coat of paint or two then searching for furniture to fit the space. I must caution that not everyone has the decorators eye so if you want to get some help or a second opinion call a friend whose home you adore to get their opinion on your space and your visions. If you like their work then you likely will want the advice they give to you. It’s a win-win situation without having to hire a designer which can get costly. When we bought our home we moved in from renting so we didn’t have much of anything. Over time we started to purchase items on sale at discount stores and kept our eyes open for any deals that came out in the flyers. Friends and family were kind enough to donate items to us because they had doubles or no need for the item any longer. Instead of recycling or selling something they asked us if we needed it first. Most times the answer was a yes because we didn’t realize how much we didn’t have when we bought our new home. We also wanted to save our money for other ventures and not blow it on decorating our home. We are garage sale lovers and although we don’t get out as often as we like now we used to go almost every weekend that we could. It was probably the cheapest way for us to acquire what we needed to decorate rooms in the house. If you can bargain with a seller you can sweeten the deal even more. Don’t just offer what they are asking, make them an offer and see if they will bite. I’m betting 9 times out of 10 they will accept your offer and you get the item you wanted for less. Search the free stuff classifieds on Kijiji or simply find the category for what you are looking for and do a search You never know what you might find. Sometimes people have leftover building materials they no longer want and will sell to you cheap or give it to you for free. If it’s not free then learning the art of negotiation is a great way to haggle a deal from the seller that fits with-in your budget and makes them happy. If you have family and friends who are moving or have kids moving out and have items they no longer need they may just send it your way. It’s a great way to make sure items stay out of the landfill especially if they still have lots of life left in them. If you find free stuff heck it’s like hitting the jackpot and if you follow this blog you know that on many occasions we have found free stuff on the curb that homeowners label ‘free’ and we take it away. We’ve found some pretty cool free stuff in the past as well probably the best being the exact remote control for our new ceiling fans in the garbage at a neighbour’s house. We decided not to buy the remote for one of our ceiling fans as it was some silly price over $30 but now we got one for free. There are plenty of great discount stores you can shop at and if you love IKEA as much as we do you can find all sorts of great bargains for a good price. Mind you not everything is top-notch quality but I’ve gotten some great deals that lasted me over the years. You might also find great deals at scratch and dent shops in your local area or consignment stores. If you already go to Value Village or The Salvation Army and many other second-hand stores you know there are deals to be had. You may have to pop in periodically to see what stock has come in but if you’re lucky you might just find what you are looking for. Keep an open eye for discount days or 50% off days to sweeten the deal even more. Plus some shops have rewards cards as well so take advantage of them when you can. If you collect rewards points on your credit card you may be able to redeem them for paint in the paint shop at Canadian Tire if you use the Canadian Tire MasterCard like I do. If you love PC and collect PC points you can also redeem for many household items in-store. If you collect points always remember to have your card handy because points lost is like throwing money out the window. Just last week we redeemed for a new food processor and frying pan and although they are not used to decorate with it was still great to get free stuff with points we earned. If you keep an eye out you will find coupons in weekly flyers. I know that Home Outfitters offers a coupon for 20% off if you buy one item at regular price. That might mean you could get curtains, pillows, lamps, bedding etc for a cheaper price if you cut out your coupon. Do that every week and you can start to decorate your house the frugal way in no time. There you have it, some tips on how you can find some frugal deals to decorate rooms in your house or apartment without breaking the bank. Never listen to those that make you feel as if you should be spending more or that buying used is for people who can’t afford new, it’s a load of you know what. If someone things your too cheap or living too frugally, remember to live your life the way you want to. Spend your money wisely and the goals you set forth to accomplish will come your way. Where did you get the items to decorate your living space? I’ve only bought 3 new pieces of furniture in 32 years of marriage and, although I do recognize the things that are beyond my level of expertise (electrical wiring, heavy plumbing) and hire someone in to help with those things, I prefer to do most of my repairs, flooring, tiling, and decorating as DIY projects. I love to find old things, clean them up, and make them useful once more. I sew my own window coverings, slip covers, table cloths, place mats and napkins. It’s frugal, satisfying, creative, and it makes our home so much more uniquely our own. Cheap? Maybe. But I’ll keep on doing it because it makes me happy. You are so handy, and probably why I love following your blog. I learn so much from you. I also use a needle and thread and sew all my pants so I don’t have to buy new ones. These are pants I use around the house, gardening etc.. but I will do what I have to so I don’t have to spend more. I think if we all put a bit of effort into trying something new instead of giving in to convenience or new all the time we may see the world from a different perspective. In my early marriage years (1967 maybe) we bought a very old kitchen table at an estate sale , with umpteen layers of paint. We spent much of the summer stripping and refinishing what turned out to be a beautiful maple drop-leaf table. When the marriage ended in 1981 my husband took the table. 2 years ago he and his (new) wife came east, for our daughters Uni graduation, and as soon as he saw me, he said ” I still have the table”. Obviously very important to him. It wasn’t just a table, but something we had done together. I have done many makeovers in the past 30 years, grew up with a make-do attitude, and resent the price that many new items cost, especially if I know I could refinish a second-hand piece and be happy with it. I say my style is “eclectic”, mostly antique, some inherited, some a little bit newer. Regardless it is my space, my place of peace, If people come to visit, to inspect my home, they might as well stay away. Come to visit me, not my decor! My house already had furniture left by the previous owner so that was fine until we got settled but I do appreciate to have nice things now, not necessarily decorations, the garden is full of orchids that decorate more than any painting but for your daily items, a good mattress, a good fridge, a good blender.. we bought everything new because they don’t do second hand much for household items, people keep their stuff until it can’t be fixed anymore or like the previous owner just leave it for the next owner inside the house. We also bought a sofa back in the early days of the marriage and hubby worked for a few months at a furniture place, they had some sweet sales at that factory!!!! We got our sofa and a “boneyard” sale for all of $166.00!! !We think it might have been a sample product that didn’t sell…. It needs to be recovered …again, but it is solid and just needs to be recovered to look awesome again. I look at it and think about trying to do it myself…….if I find some fabric I really like cheap enough………..I just might …….wonder what Farbicland has……. Good for you Christine! Another place to look for affordable upholstery fabric might be your local bespoke furniture stores. They tend to change fabrics annually (to encourage people to change stuff to keep up with the Joneses) and, if you’re not concerned about keeping up with the latest trends, it’s possible to buy the “old” fabric from the previous year at very low prices. Usually good quality too! A well argued post here, CBB! I cannot stand the thought of spending time, money and energy on decor. It’s just that I can always think of a better way to spend those dollars and that time. So in 10 years, our house has got a new AC unit and that’s about it. There is furniture, but it’s all old and there are no plans to replace any of it;) Some of us, like you, simply choose to spend our money elsewhere. Am I supposed to decorate for company? I could not care less what company has to say about our decor. Exactly, that’s what I mean. Some people spend a fortune but maybe it’s for their own satisfaction I guess. I dunno, wouldn’t work on me. We just went very slowly furnishing our place. It probably took us 3 years before our living room was “finished”. In the meantime, we just went about our business, no big deal! I don’t usually DIY often and end up paying way too much to furnish my condo. I’ve never been to IKEA since my closest one is 3 hours away but that’s a less expensive option to check out too. My wife is the crafty/DIY type so she did a lot of the decorating herself (and we still have more to go!). When it comes to furniture I usually prefer new (especially couches because of my allergies) so I bought a lot at ikea. I definitely am up for refinishing some older wood furniture, though, and can see myself doing that if I ever have time. I like refinishing wood as well.. so I’m always on the look-out for vintage. I’m not big on couches unless they are leather. I think we have to be picky for some things but if you know what you want and you find it, grab it if it’s a great price. Cheers DC! “Just because you are debt free doesn’t mean you should go hog-wild with life.” I could not agree more Mr. CBB! I think that too many times people will use that as an excuse to overspend when they shouldn’t. For us it comes down to quality, value and what will fit in our budget. Sometimes that means new, sometimes in means used. It depends on the situation and what we’ve allocated for it. That’s true mate. You can find some seriously good valued items at second hand shops that might need a bit of elbow grease and it’s worth it. Great tips, I’ll have to keep this post handy for future reference… My wife and I stay on a roller coaster with home decor. We save money and turn a blind eye for a while until we just can’t take it anymore, then we blow a couple hundred dollars on DIY projects that make us feel a little better but don’t really make the room look awesome, then we save again.